It's More Fun When You Win! Yes, thanks to my editor Ed and with some consultation from the Professor, another Dice Setter Newsletter is on-line. Also my thanks goes out to all subscribers of the Dice Setter Newsletter. After our subscriber confirmation in January only 5 subscribers unsubscribed out of the total list just over 5,000 . Whoa! Your continued loyalty and support of my web site is greatly appreciated. I am glad to know that DS.com continues to serve the dice playing community. Please keep sending me your emails and questions about the game. Flying the flag high, the Dice Busters program for June 23rd sold out just ten days after announcing open enrollment. The 2011 and 2010 programs sold out as well. I think that's called the "hat trick", mixing my sports here. The Three Amigos, (Dice Busters) agreed to a second program on June 24th. The Dice Coach tells me that he has already has reserved 25% of the available seats. (Sounds like a lot but really it is only four reservations, but since we only had twelve to begin with, the math is right.) His newsletter already went out a week ahead of mine. If you are seeking the best single day exposure to the experts of the game, let me again plug my collaboration with the Dice Coach and the Professor. You will not be disappointed. If you have considered attending our one day craps program, perhaps this is your time. Join me and mi amigos June 24th. Dice Busters Click on the link for the details and you can read the roll results of our three hour session from last year. Keep the dice on the table! How far back in the archives of memory can you go to recall the first time you were told “keep your eye on the ball”? For me, I was so young that I had no idea of what the advice meant and I was confused. How I would ever get my eye out of my head and on to the ball, never mind answering why I would want to do such a thing? In education, this is known as a misconception. It is the job of a teacher to discover students’ misconceptions and demystify them in order to promote learning. The theory of dice setting and manipulation is fairly simple and you can find numerous pages within the Dice Setter web site explaining the process. What is not so simple is for the player to develop a consistency with their toss from table to table, casino to casino, and from the home practice rig to the real thing. Demystifying the misconception, that all you have to do is practice a lot, does not necessarily get the prize. If you practice with wrong notions or bad habits, you will become very good at the bad habits and notions. “How come my dice look great at home and at the casino they look like junk?” is a question that comes my way several times a month. 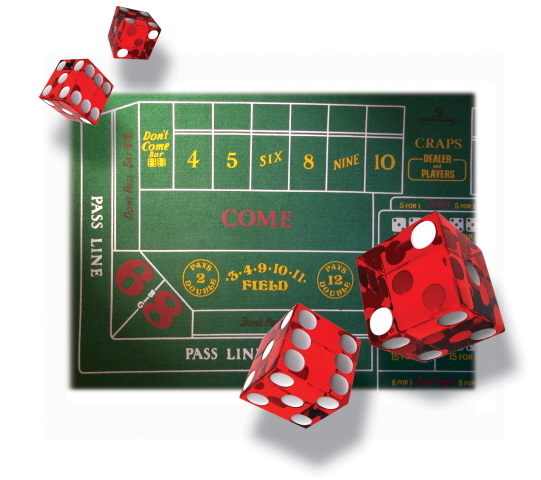 No two casinos are a like any more than any two craps tables. Certainly a practice rig at home, even if you have your own table, it is not going to be like the conditions found in a live game. What is the point then of practice? Observing the dice as they come out of your hand will immediately tell you everything about your resulting throw. Watching the dice fly through the air, rotating, landing, and their position, provides you with valuable information. Without this information you will not be able to make adjustment or correction to an errant toss. You will be stuck wondering if you are just wasting your time. The list below is simplified, never the less I present key important elements for consideration if you feel that you are missing something in your toss. Every sport has specific physical postures to obey for optimum results. In golf keep your head down. Baseball, eye on the ball. Football eye on the ball. Basketball bend knees, arch the ball, eye on the goal. Archery eye on the bulls eye and anchor the hand drawing the string. Okay, that should give you the idea of some hand eye applications. Once you have gripped the dice, position your hand with the dice perpendicular and parallel to the table. Next you are able to turn your head and focus eyes on your landing zone. (Hand/eye coordination) You look at the place where you intend to drop your dice. Your hand is anchored and your eyes dictate “range to target”, lock and load, message sent to your throwing arm. Forward motion with building momentum directs the speed and arc. As the arm swings upward, your hand comes into your field of vision. Since in the split second before shooting the dice, you sent the message, eye to brain, brain to hand, where to toss the dice, you now can observe how the dice leave your hand and travel in space to their destination. Like following a duck shot from the air, carefully observe every element once the dice leave your hand. As you train yourself to develop this skill it slots in automatically same as the way you quickly arranging the dice before picking them up. With practice it is second nature just like a quarterback scours the defense looking for their open receiver. In this way you can observe any inconsistencies in your toss, table to table, and know what is happening with your dice. Once you recognize a flaw, you just have to make an adjustment in your procedure. I guess it is true. Beauty is in the eye the... dice holder. Thanks to the Professor at P4K for helping me with part of observation and hand eye for dice. your experience playing dice forever! Welcome to the Complete Game of Dice! You will not find a more comprehensive live gaming workshop experience. If you are not 100% satisfied, your tuition will be cheerfully refunded. Michael Vernon - The Professor. Yesterday's quote 24 years ago: "The world of the common man is about to unravel, like never before. I seek the attention of those that are strong and getting stronger. It is only through the power of these 'individuals' that the spirituality of the world will survived the hurricanes of change. There is little time." Keep the "Boys On-Line" with a Toke! Dice Setter Newsletter comes to you free of charge. Help keep the dice tumbling. Your generous donation is much appreciated. Click the Pay Pal Button to Contribute with Your Financial Support. Dice Setter Newsletter Thanks You! PLEASE: If you have any comments or ideas for future issues, feel free to email me at ed@dicesetter.com and as always, I'm looking for contributors with a fresh perspective. If you know someone who would be interested in receiving future editions of DiceSetter.Com's Newsletter, tell them to send a message to dicesetter@aweber.com. Good Luck! & A Link Back to DiceSetter.Com Please Email ed@dicesetter.com for more information.